FirstEscapeGames - FEG Escape Game: Corporate Office 2 is another point and click escape game developed by First Escape Games Team. Assume that you are working at this corporate office. Today you have a presentation to make, but you have lost the file on the computer due to technical issues. Now you need to retrieve the data from the computer, because your carreer depends on this presentation. 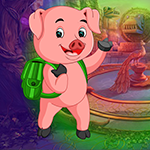 Solve puzzles and use clues to achieve your task. Good luck and have fun!